Many seniors are afraid of being active because they are concerned they may injure themselves. The National Institutes of Health noted that over 1.6 million older individuals in the U.S. end up in the emergency room due to falls, so it's clear this fear is warranted. "Many seniors are afraid of being active alone." To ease your loved one's anxiety, exercise with him or her. First, talk to the person's doctor to learn what physical activities may encourage weight loss. Some older people have very limited range of motion, so isometric exercises, or slow, light stretches, are helpful, yet not too strenuous. For the more agile senior, try going to a local community center to enjoy time in the hot tub. Heat lubricates the joints and can alleviate any pain from arthritis or other conditions. Then head to the pool for water aerobics. It's much easier for seniors to move in the water than on land due to the reduced gravitational forces. Having you there will make working out more fun, and your senior loved one will be more likely to get active when he or she can count on your company. If you know a senior who is in independent living, visit him or her at home and cook together. It's not all that fun to make meals for one, but with you there, making dinner or breakfast can be more enjoyable. Bring along tasty ingredients like fresh produce and whole grains, so you'll both be eating a good meal. If the senior resides in memory care or assisted living, you can meet him or her at the community to visit the dining room. Many assisted living communities like Edgewood offer three healthy meals a day. Items like roast beef, tasty sandwiches, grilled chicken and fruit salad are both flavorful and provide beneficial nutrients that can help your loved one shed some extra weight and feel better. 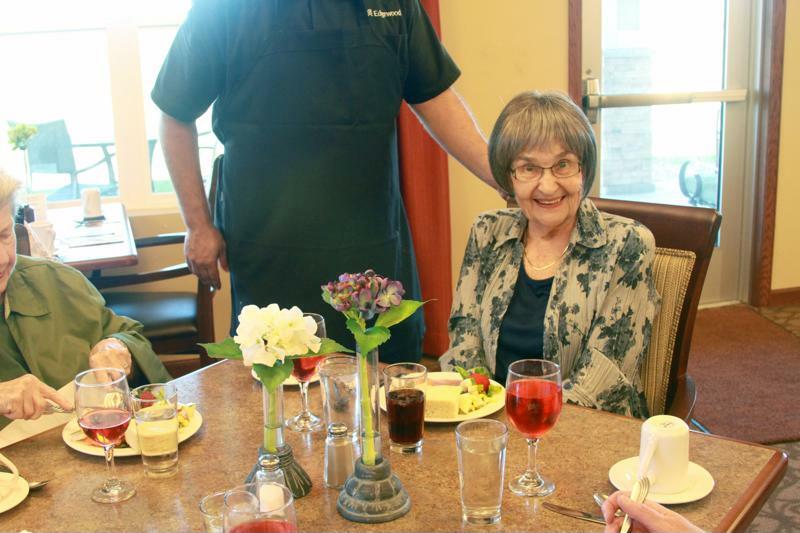 Assisted living community dining rooms offer healthy dishes for senior residents. Some seniors could benefit from trying a diet. Many older individuals enjoy indulging in decadent desserts because the sweet taste buds are some of the last to lose their senses. However, keeping a candy bowl on hand and baking tasty pastries may not be a great idea when it comes to minimizing his or her waistline. Bring the senior to his or her doctor and discuss possible dietary changes to promote weight loss. The physician should offer a few ideas of items to cut out, like processed foods and saturated fats, or may send you to a dietitian or nutritionist. Some senior living communities even have these professionals on site to provide guidance to residents. When someone is trying to lose weight, encouragement can be a huge factor in his or her success. Check in with your loved one to see how he or she is feeling. Let the person know that you are thinking of him or her and offer to help in any way you can. That may mean driving him or her to the grocery store to buy healthy snacks and avoiding the candy aisle. Or, maybe the senior will ask you to come over and join him or her for a walk to burn some calories and enjoy spending time together. Your presence can make all the difference in the senior's weight loss journey.